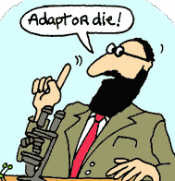 Survival’s “A” stands for adapt. The ability to adapt to any given situation is key to survival. Our best laid plans often come to naught and following them rigidly can lead to demise. Remember the motto “Survive, adapt, overcome.” Adopt it, live it, breathe it!